Anne Randall is the pseudonym of A J McCreanor, author of the fabulous crime fiction debut novel RIVEN that was published in 2014. RIVEN was the first in Randall’s series to feature her detectives Wheeler and Ross. SILENCED is her second, and is every bit as harrowing as the first. The story begins when Mark Haedyear, a notorious murderer, escapes from custody after his mother’s funeral. Now he is on the run and the girlfriend of the man believed to have grassed on him to the cops goes missing. Haedyear had murdered his original victim by burying her alive, so it seems as if history is about to repeat itself. Things begin to get nastier when the body of a homeless man is found dumped amongst rubbish near a park in Glasgow. The only clue to the possible identity of the killer is a small card left near the body. The card comes from the mysterious Letum Institute: an organization interested in the afterlife and contacting the dead. It also funds a homeless hostel in the city and it could be that there is a connection between the hostel and the dead man. Wheeler and Ross are called in to investigate but clues are few and far between, and they feel as if they are getting nowhere fast. As if things couldn’t get any worse, Fiona Henderson, daughter of Haedyear’s first victim has also gone missing. She turned into a mute recluse after the murder of her mother and spent increasing amounts of time homeless; avoiding her father and sister and trying to come to terms with her loss. With Haedyear’s escape from prison, the pressure is on to find Fiona, in case she becomes a victim too. Wheeler and Ross have their work cut out for them if they are to get to the bottom of their case before more people are killed. 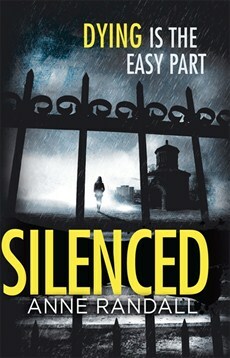 If you enjoy your crime fiction a bit on the dark side, then you are going to love this latest book by Anna Randall. It also has a wonderful twist at the end that you won't see coming. It blows you away and leaves you feeing exhausted by the time you have finished the book. Overall, a fabulous story by this gifted author that keeps you guessing and captivated, from the first page to the last.